Each natural stone type has different structural properties that have an impact on its look and feel. From up close, granite, as its name indicates, has a more granular look as opposed to marble or quartzite’s smoother feel. From a distance, granite and quartzite constitute the epitome of natural stone’s beauty: lots of movement, veins and variation with a rich combination of colors that make each piece unique. If a friend picks the same granite for her countertop, it may look like yours but it will never be the same. Marble, in some of its more high-end options like Calacatta and Statuary White (which have been quarried for centuries Carrara, the heart of the Italian Tuscany) also present those beautifully and naturally crafted veins. 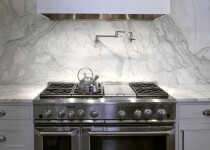 Combined with the luminosity that their white background brings, Italian marble always delivers the wow factor. Most marbles, limestones and sandstones, however, have a more standard, one color look with occasional veins and spots making it perfect as a background choice on floors and walls. Onyx and natural quartz share a unique quality that adds to their magnificence: they are translucent. They are often installed with light bulbs behind them that, when turned on, make the stone glow and enhance the radiance of its colors. Onyx is a more delicate stone often used in table tops, bar tops and occasionally, bathrooms. Quartz is very hard and resistant and it is therefore suitable for any application. Semi precious stones constitute the ultimate choice for luxury homes. Uniquely stunning pieces of jewellery for your home that never go unnoticed and are easy to fall in love with. Color is the attribute that makes natural stone such an interesting choice because of the variety of options and combinations available. It’s not a question of whether you’ll find the exact color you are looking for, it’s whether you’ll be able to select one of the many matches you’ll find. Furthermore, natural stone has the ability to surprise you. It’s not unusual for our customers to enter our showroom with a stone in mind and to walk out selecting something different. That is because walking around our exclusive Stone Gallery they found that stone that touched something deep inside of them and made them change their mind. The most popular finish for natural stone is and has always been the polished finish. It’s that shiny and smooth look that always delivers and never gets obsolete. The other traditionally popular is the honed finish; the standard for limestone and sandstone and commonly used in marble and travertine, it stands as a non-reflective alternative to polishing stone. In recent years and since honing granite never became too popular, a new and improved non-reflective finish has been growing in popularity: the leather finish. It’s called leather because, rather than presenting a smooth and uniform surface, it enhances each granite’s natural veins and movement by slightly carving the softer areas of the surface. The result is a leather-like feel that makes your granite countertop look more unique and natural. The antique and tumbled finishes on marble and travertine generate an effect comparable to leather on those stones.